Remote desktop session has played a dispensable part in our life. It delivers us a thoughtful platform to connect with others via virtual network. In the past, it was mainly used by businessman to hold a meeting. Owing to its facility, it is well-known and adopted in different aspects, like educational course, family communication, etc. Popular as it is, there is a tendency to make remote desktop session for future playback. The fastest way is to get help from an easy-to-operate capturing tool so that you will not miss some key points and have chance to recall pleasing moments. If you still have trouble in making a decision, you can follow our step to see how to record remote desktop session with the best remote desktop session recording solutions. Joyoshare Screen Recorder is a fairly dedicated video capturing tool. It provides optimal solutions to record not only remote desktop session, but also any other screen video activity, such as Google Earth tour, HBO Go program, Omegle chat, Facebook call, etc. It is workable to grab video as well as audio at the same time. Thus, you can determine whether preserve system audio or microphone sound. When finished a remote desktop session recording, you can produce it to any common formats, for example, MP4, AVI, FLV, SWF, MPEG, WMV, MKV, MOV, etc. With the most top-leading screen capturing technology, it comes with a wealth of charming features. You can switch different mode to run Joyoshare Screen Recorder as either professional video recorder or independent audio capture. In addition, it also offers capability to create a scheduled task ahead of time by setting exact start time and end time. Similar to other screen recording software, it is available to take screenshot, select formats and highlight clicks at discretion. Flexibly, it has access to make a recording in full screen or with customized size. Any captured videos can be uploaded and shared to YouTube. The following instruction will show you how to make a remote desktop session explicitly. Go straightly to your desktop screen to launch Joyoshare Screen Recorder. The precondition is that you have installed it already in advance. It is easy for you to see the "Capture Area" section in the intuitive interface. Click the "+" button and a pop-up window will appear in your sight. Drag the edge of capturing frame to a proper position. No matter how large you want, you can make it. Certainly, there is standard fixed ratio for you to choose from, including 320x240, 640x480, 1280x720, full screen, etc. Hit the gear icon and you will see following interface, which is made up of all capturing settings. Joyoshare Screen Recorder empowers you to remove unwanted noise from a remote desktop session. It also includes full supports for recording both video and audio in synchronous, choosing desirable output format, presetting shortcut to be used later, adding effects to cursors, etc. 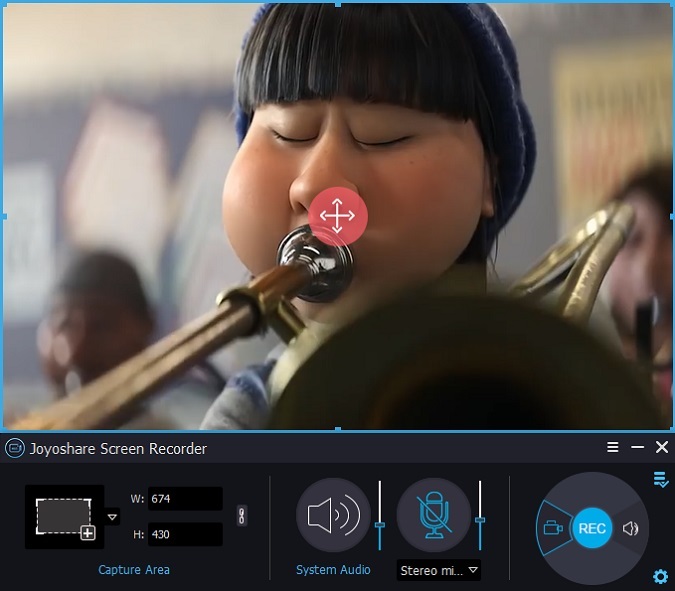 Note: To make Joyoshare Screen Recorder work for you as an independent audio capture, you have right to grab any audio tracks, for instance, game music, online radio, system voice, microphone sound, etc. All captured audio can be saved as MP3, AAC, WAV, FLAC, M4A and M4B. Hold a remote desktop session with others. Joyoshare Screen Recorder has ability to support any programs, like TeamViewer. 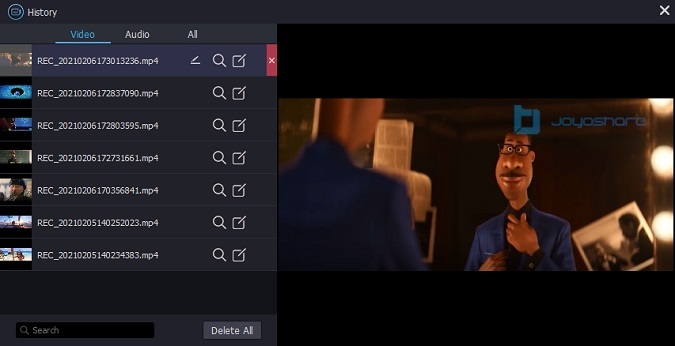 Press "REC" button to initiate a recording process, during which you can split video to different segments to cut unsatisfying clip. Of course, if you want to store a moment to your local folder, you can preset the storage location and take screenshots at any time. Joyoshare Screen Recorder has the options of managing recordings according to your actual needs. You are permitted to preview final video, delete imperfect clip, revise its file name, correct ID3 tags information, etc. The other straightforward way is to draw support from one simple online screen recorder. Given that there is no any program installation requirement, it is time-saving to make a remote desktop session recording online. What's more, some online screen captures also come with essential recording features, like quality-adjusting and task-creating. However, the shortcoming is that it might not as safe as offline apps considering it works relying on internet. Besides, the required launcher is java-based, easily causing date leakage. There are all types of online screen captures in market, such as Apowersoft Free Online Screen Recorder. You can refer to following quick guide to make a remote desktop session recording free of charge. Install a launcher to activate Apowersoft Free Online Screen Recorder if it is your first time to visit its official website. Then you can simply press the "Start Recording" button. 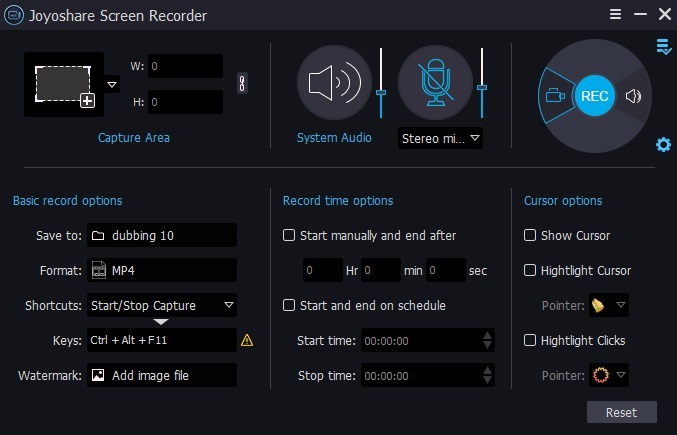 Apowersoft Free Online Screen Recorder layouts all necessary parameters in its recording interface. You are allowed to set capturing hotkeys and audio input. Surely, you can also decide whether to show mouse spots or not. Now open any program with remote desktop screen. 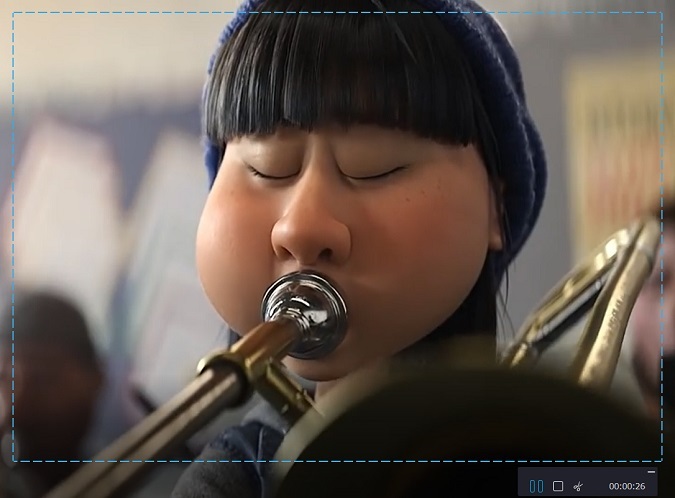 To let all minor details be evolved in recorded video, you can enlarge the presentation window. After choosing a recording area, you can click "OK" and begin the capturing instantly. The "Web camera" can be selected as well so that it will be presented into recording. There are more available options provided, like adjusting volume, adding text, shapes, lines, etc. Click the red stop button to end the recording process. You can find it in its media library.